Manufacturers are trying to drive business based on far too many metrics; metrics that often conflict and put employees in a state of oscillation between contradicting goals. Pam Bednar, VP of Marketing for Synchrono shared, "Manufacturers must create a distinction between operations metrics reports versus actionable metrics." Performance impacting metrics are not intended for overall business analysis; instead, operations metrics provide insight to drive action to improve flow, manage constraints, direct continuous improvement efforts and more. Automating actionable metrics is at the heart of lean manufacturing in 2016 and beyond. It moves data beyond simply eliminating waste in an operation. Moving toward Demand-Driven Manufacturing requires looking at the business through different lenses, including what and how to measure and the impact on behavior. One of the main culprits that wastes time and money is constant expediting. A system that helps control and prioritize the release of orders into the production process based on true customer demand significantly reduces - or eliminates - waste and disruption costs associated with expediting. Automating real-time data allows manufacturers, particularly discrete, ETO (engineer-to-order) manufacturers, are now aligning behaviors and processes with performance goals for measuring lean initiatives. Over-production is a major form of waste. If the full capacity of a machine is not needed to meet customer demand, then the cost of these machines standing idle is much less than the wasted effort to keep them humming without actual demand. It is far from lean to blindly build inventory completely decoupled from demand. Ensuring perfect capacity utilization is defeated when there are still thousands of dollars of parts waiting for an order that never arrives. In a synchronized environment, lean manufacturing activities center on flexibility of resources; they can flex and bend to stay in alignment with actual demand. Continuous improvement is a process for becoming increasingly competitive by improving efficiency and quality through systemic, incremental changes normally driven by kaizen (focused improvement) events. In demand-driven environments, continuous improvement efforts look to address the most significant disruptions to production flow. Often, synchronization (connecting people, machines, materials, and methods) is used as an initial continuous improvement tool to quickly find constraints that inhibit flow. Bednar noted, "Getting closer to data through synchronization ultimately allows manufacturers to apply a more critical focus to continuous improvement efforts. Technology like Synchrono uses analytics gained from monitoring machine and materials data to pinpoint quality issues that negatively impact flow. Data does not lie and the volumes of truths that a synchronized enterprise can lead to a continuous improvement program." Demand-driven leaders know that the only thing that will ensure success is empowering people to find the constraint, managing the constraint to protect flow, and creating a culture that drives individual ownership of processes so that it is continually supported and improved at a global process level, not through localized efficiencies. Leading a demand-driven transformation is challenging and some companies are not ready to migrate from cost-centric to demand-centric analytics and/or manage the change in behavior needed to support the associated metrics. The old Push methodologies adjusted everything according to forecast. Reactive organizations are characterized as functional units that are "aligned against specific business unit objectives" which often live in systems that track traditional cost accounting measures for success. A cost-accounting viewpoint is based on past performance with little or no attention paid to the actions taken to meet customer demand. If the production floor fails to meet projections and meets every customer expectation instead, they can still be viewed as a failure. The Push-based metrics of the past worked well-until manufacturers had to react rapidly to new and emerging customer demands. Demand-driven factories change virtually all their metrics because previous measures were based on local efficiencies and supply-optimized push philosophies, not pull-based, demand-driven methods focused on actual customer orders. With the ability to visibly follow the customer demand signal through the supply chain, the metrics change - for the benefit of the customer. 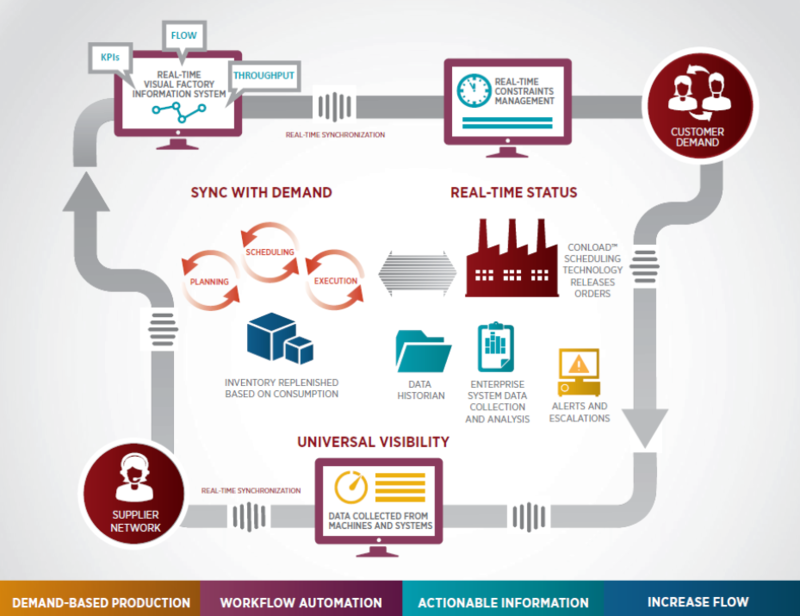 A Demand-Driven Manufacturing Platform becomes a system of differentiation by synchronizing all layers of manufacturing and freeing data across systems for collective reporting, analysis, and decision-making. Differentiation is gained through improved quality, increased capacity, on-time delivery, and more. Like Demand-Driven Manufacturing itself, the Demand-Driven Manufacturing Operations Metrics for Action are based on synchronization and managing constraints to drive flow. Improvements in these areas lead to improvements in the core metrics of throughput, inventory and On Time Delivery. Bednar concluded that the role of measurement in the demand-driven value chain can now be easily measured, and followed with suggested actions for continuous process improvement.